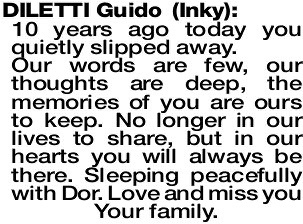 10 years ago today you quietly slipped away. Our words are few, our thoughts are deep, the memories of you are ours to keep. No longer in our lives to share, but in our hearts you will always be there. Sleeping peacefully with Dor. Love and miss you Your family.